Just your average four eyed disabled geek. This blog is my way of sharing my life and experiences as a disabled four eyed geek; all of which influence my life in various ways. Iâ€™ll be blogging about gaming stuff, life as a disabled student as well as posting beauty ideas, reviews and tutorials. This what your Just Geeking By Blog Ad will look like to visitors! Of course you will want to use keywords and ad targeting to get the most out of your ad campaign! So purchase an ad space today before there all gone! 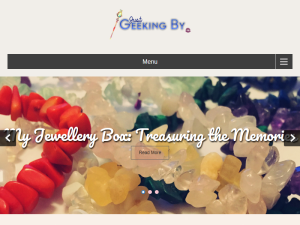 If you are the owner of Just Geeking By, or someone who enjoys this blog why not upgrade it to a Featured Listing or Permanent Listing?